Sept. 20, 2010, 1:30 p.m.
By Nikki Usher @nikkiusher Sept. 20, 2010, 1:30 p.m. The essential question facing newsrooms today is this one: Does more speed and more content come at the cost of creativity? 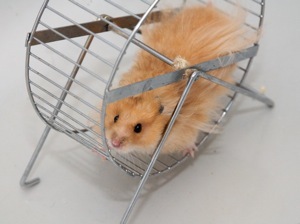 Does the “hamster wheel,” as described by Dean Starkman in this month’s Columbia Journalism Review cover story, reduce journalists’ capacity to move stories forward instead of playing catch-up online? And does the demand for speed and the hunger for clicks come at the cost of thoughtful editing and crafting of stories? This question is at the core of my (almost written) dissertation — when news is made in an online newsroom, what happens to the invention process? But it is my contention, after having the privilege to spend five months, day-in and day-out at Business Day at The New York Times, is that even though many journalists there often feel like wire reporters, many also feel that writing a story five times actually makes their work better. But that division in sentiment is not the heart of the argument. My sense so far is that there are five factors that encourage creativity in newsrooms even at a time when journalists are producing more with less. — Newsrooms, recognizing that news is everywhere, need to differentiate their content. What makes a story in The New York Times business section — even if it the third time it is written by a staffer — different from the same story in The Wall Street Journal? The hope and aspirations by editors, at least, and the goal expressed to me by the close to 50 journalists I interviewed on the business desk, was that the intention of every story was to provide “added value” — something that other newsrooms wouldn’t have. Most journalists referred to the news that everyone else has as “commodity news” — the news that you can get anywhere. But if newsrooms are to survive, newsrooms as they produce multiple iterations of the same story throughout the day must provide something different than their competitors. This challenges the journalist further to provide a different take, and the most successful journalists will be able to distinguish their content. Those who win that battle will also win the click battle, eventually. — Newsrooms that still have a print cycle have to pause and think about the day ahead. If print newsrooms are to remain competitive, there is necessarily a point at which journalists must think about what’s going to be in the paper. If a developing news story has been up on the web all day for readers, newspapers won’t maximize their return by just plopping that story into the next day’s paper. At The Times, the story in the print paper was viewed much more as a “second-day story” — even if the event had taken place the same day the story was written. A few staffers said that The Times in print was become more like a daily news magazine than a daily paper, giving people a step back from the daily hubbub of the news to provide a deeper and richer story. Take, for instance, a Goldman Sachs earnings report. In the morning, it might be a routine earnings story with the numbers. Over the course of the day, a reporter might differentiate that story with different questions asked to bigwigs at Goldman, different snippets of life from the trading floor, and perhaps proprietary reporting gleaned from sources, or even takes on the earnings from academics. At a certain point in the day, the rewriting of the story stops and it becomes time to look for the big picture — there has to be enough that people who haven’t been following the story all day have enough to understand the story, but there will be a larger tale, perhaps about the broader significance of the numbers, or what larger trends at the bank might mean, or other take-outs that make the story different from competitors. And don’t forget: This final print story is the final story that ends up online. — Speed only applies to certain kinds of stories. Only certain stories lend themselves to the kind of developing coverage that would require multiple rewrites. Hearings on Capitol Hill might lend themselves to something like the attention of a live-blogger plus the attention of a reporter tasked with covering the take-out stories as they develop, from pre-written statements to the actual question and answer period. On the day Apple’s iPad was introduced, I saw multiple stories being written as the story developed — and the attention of everything from a live-blog to all-hands on deck with Twitter and The Times’ Bits blog. These stories require constant updates because something new is happening as the day develops. There is more to add to the story. And determining which updates are worth including is the careful task of editors and reporters who must again decide where added value comes in. But it is my thinking that newsrooms, even those with increasingly limited resources, also understand the importance of pacing and managing staff. A newsroom that has everyone devoted to playing catch-up will not have the substantive stories that will distinguish their news from all the other products out there. Thus some reporters have to be taken off the breaking news bandwagon — this may be for particular days, or it may be that some reporters simply do not have to do regular breaking news. This is one way to keep coverage fresh and inventive. A newsroom that can figure out how to allocate resources will be a newsroom that continues to remain creative and one that ultimately will keep readers coming back. — The audience does want more, now more than ever. And journalists can listen, too. Presuming a developing story will go through multiple iterations, it is reasonable to suspect that audiences will be checking back. Or that since the audience is fragmented, there are different audiences checking in at different points of the day. Shouldn’t we have something for audiences that choose to follow the story over the course of the day? And shouldn’t we have something for audiences that choose to read just once, say at 3 p.m., instead of the moment that the news is breaking? My thinking is that the audience wants more from journalists because journalists can provide more; the voracious news consumer (and ultimately the news consumer who will be most valuable when news organizations switch to paywalls or meter models) will be checking the site frequently. And for those drop-in audiences, people who maybe check once in the morning and once in the evening, don’t they also deserve something new? But there’s another element here: Developing stories also are also the ones, I’ve observed, to be most likely to be open to comments. Though not all journalists have gotten the hang of reading comments or monitoring Twitter, they are definitely reading reader email as it comes in. And this audience feedback provides journalists with new opportunities for direction for stories, and a sense of how their stories are being received in a way that they never could have had before. This sense of instant feedback on a story’s progression has the opportunity to shape reporting. This is still early in its development, and at this point most likely to affect reporters who can monitor Twitter and check comments as part of their regular routine. But I see great opportunity for audience feedback shaping developing news in the future. — Speed also means more attention has to be devoted to more than just the text of the story. If a story is going to be big enough to merit multiple rewrites — if it is a developing story all over the web — you better hope that the story isn’t just text. The room for creativity does depend on the capacity of newsrooms. At The Times, the newsroom is privileged to have an amazing staff of web producers, graphics folks, photo staff, and videographers who can create a multimedia package to go along with a developing story to make that story stand out. But the lesson is true for newsrooms that do not have the same depth of resources as The Times (which, it must be said, often can’t do everything it wants, either). There are other ways for stories to become more than just stories. Without multimedia, reporters even as they go about collecting their moment-by-moment updates, can also be engaged with conversations on social media platforms. This is an adjustment for reporters, and it certainly adds another layer to the concern about speed and burnout, but it inspires, as I noted before, creativity — and it adds further interest to the story. I have seen reporters working on intense deadline pressure on competitive stories use social media to enhance their work — extending the story beyond text. For those looking for some inspiration, check out what Michael de la Merced, Brian Stelter, and Micki Maynard (who has since left the paper) have been able to do on big stories. So am I setting up an unfair example? Certainly you could argue that a place like The Times is an outlier and an unfair place to start talking about creativity under pressure. But I don’t think that The Times is doing anything that other newsrooms aren’t, except for perhaps the amazing multimedia opportunities. The Times is still in fierce competition to distinguish coverage, reporters are still writing multiple times during a day on developing stories, and the challenges on journalists to do ever more are common to all newsrooms. But I see incredible opportunities for the hamster wheel to produce even better journalism — it just might take some time to figure out. POSTED Sept. 20, 2010, 1:30 p.m. Usher, Nikki. "In a hamster-wheel world, is there room for journalistic creativity? Evidence from The New York Times." Nieman Journalism Lab. Nieman Foundation for Journalism at Harvard, 20 Sep. 2010. Web. 18 Apr. 2019. Usher, Nikki. "In a hamster-wheel world, is there room for journalistic creativity? Evidence from The New York Times." Nieman Journalism Lab. Last modified September 20, 2010. Accessed April 18, 2019. https://www.niemanlab.org/2010/09/in-a-hamster-wheel-world-is-there-room-for-journalistic-creativity-evidence-from-the-new-york-times/.